Two months ago, I calculated the growth in "utilization factor" of various android versions by measuring the ratio of their browser usage share (measured by NetApplications) to installed base share (from Google's version data). The data showed that browser usage on Android 4.0 was steadily outpacing that of other Android versions. Based on this, I surmised that the "engagement gap" between Android and the iPhone would soon begin to close. Let's take a look at the current state of that gap. For now, there isn't much we can do about the first problem, but there are solutions to the other two. The only major tablet to be launched with Android 4.0 was the Kindle Fire HD, which was launched in September 2012. Therefore, the impact of tablets on Android 4.0 utilization is unlikely to be material, given the small install base (relative to smartphones), at least until September 2012. And finally, the last problem is a bit of a red herring - utilization factor is a relative measure, not absolute (ratio of usage share to install base share). This means that an increase in utilization of one android version, without a corresponding decrease in another, leads to a decrease in the utilization of competing platforms. This does not mean that the absolute usage of the iPhone has reduced, but it means that its usage share (with install base normalized for each OS version) has reduced. 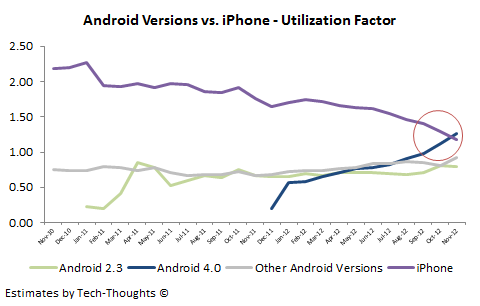 So how do we measure the iPhone's utilization rate relative to Android 4.0? The easiest way would be to incorporate ComScore's US installed base data (available until November 2012). Since NetApplications' usage data is skewed to the US market and the split of Android versions in the US is unlikely to show wide variation, the results should be reliable. Now, all we have to do is measure the installed base share of the iPhone and various Android versions and use these as the denominators for the respective usage shares. 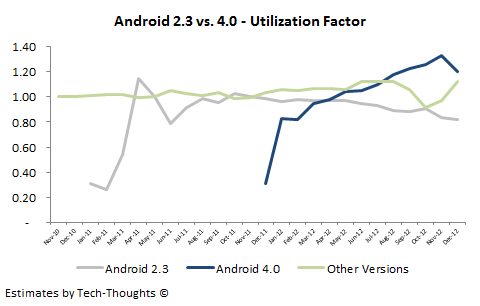 The chart above clearly shows that Android 4.0's utilization rate has surpassed that of the iPhone. Even if we ignore the data after September 2012 (owing to the Kindle Fire HD launch), we can see that the utilization is at least comparable. The drop in Android 4.0 usage is likely to have a negative impact in the utilization rate in December, but as the first chart showed, this has been made up by an increase in Android 4.1/4.2 usage. Based on this, I would have to conclude that the browser engagement gap between Android and the iPhone is a thing of the past. The next step is to measure the state of the engagement gap between Android tablets and the iPad, but that data may be more difficult to come by. I find this Utilization Factor to be unsettling because it doesn't independently measure each entrant. Even if iPhone users continue to use their browser as much as always, the utilization factor would be expected to decline as people on other platforms start to use theirs. For this reason, it is not a good metric. What you need to do is get off of market share and instead report as page hits per user by platform or similar metric. Sameer, please help us understand your iPhone calculation, especially Installed Base. If a user has upgraded (2nd, 3rd, 4th time) are they counted a 1 (or 2 or 3 or 4) in Installed Base. It's quite simple really. Every month ComScore releases their estimates of the smartphone install base, by platform. These estimates include all active smartphone users, irrespective of whether they are replacement buyers or first time owners. Also, this does not "double count" replacement buyers. Each smartphone owner is considered a single data point, irrespective of the upgrade cycle. All I did was take the ratio of the iPhone's usage share to the install base share. I did the same thing on the Android side after splitting the Android install base into active versions (as per Google's data).